2007 Honda Accord Pros and Cons | Page 1 of 2 | Why Not This Car? What drives people to buy (or not buy) a certain car? 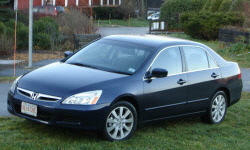 TrueDelta's members share 2007 Honda Accord pros and cons based on their real-world driving experiences. Like anything in life, there's pros/cons. The car is reliable, yet the buzzy engine and squeak clutch can be annoying at times. With the 4 cyl and manual transmission, I was getting 29-30 mph combined. Then I went to full synthetic oil and started getting 33-34 mph. Love that mileage in a comfortably sized car. It is uncluttered and clean looking. Decent color choices though limited interior color choices. Owned a 1998 Accord EX-V6 4-door sedan. Was highly satisfied with control layout and the car in general. Disliked automatic transmission. See previous response, but both personal experience and general reputation of this vehicle are excellent. My 1990 Accord had proven to be a very satisfactory vehicle. The only major problem was an overhaul of the front end at about 140K miles. Leather trim and upscale wood look interior, gauges. At 16 months now. Still have not taken in yet for any problem. Prior Cadillac Deville was so bad with 33 problems we had to get rid of it. Lost $34,000 in 4.5 years also. Just did not want another "American" engineered car. When you shut the doors you can just tell that everything fits together well. The leather interior is very nice. No gaps in the panels anywhere on the car. With good Kumho Ecsta SPT tires the car handles and corners acceptably for a midsize sedan. 7 years, 84k miles, $200 for repair(evaporation sensor) total. They are not often or enough.